Folks, get ready to measure your antlers! 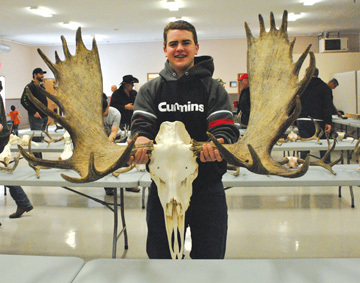 Commentator/Courier File Photo THAT IS ONE IMPRESSIVE CATCH: Tristan Stesnrud held up a big set of antlers at the 2017 event. The Bow Island Fish and Game Society is holding its annual measuring day Feb. 9 at the Bow Island Multiplex, giving hunters and outdoor enthusiasts a chance to get together, mingle and have their hard work put to the test. The day starts at 9 a.m. and people are encouraged to bring horns, skulls and pictures from present and past hunting seasons for a chance to win a number of prizes. People bringing horns are asked to arrive before noon so they can be measured in a timely manner. “We encourage everyone in the area to bring in whatever they were able to harvest this past year,” said president Calvin Ell. “White-tail, mule deer, elk, moose — those are the tradition ones and we have spots for fish and other animals if they get brought in. It costs $2 at the door to get into the event and the group will be selling memberships all day to join the Fish and Game group. “A membership is $35,” he said. “We’re a non-profit so we ask people to pay a little just to help keep us going. Ell says the group also hosts categories for youth hunters every year. “It’s always good to get young hunters out,” he said. “I take my granddaughters out hunting with me and I try to promote it — that’s what we’re about as a group. At the end of the day, Ell says everything brought in for scoring is worthy of a gold medal.